Google is really pushing the arguably dying Google Buzz. 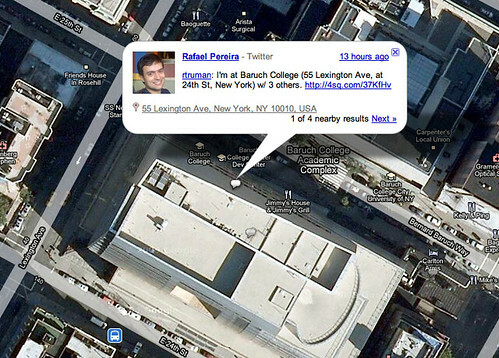 Now, Google is placing a layer of geo-specific Google Buzz threads in Google Maps. 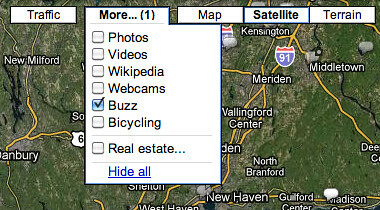 To view the Google Buzz layer from your computer, go to Google Maps in your web browser and select Buzz from the More... menu in the top right corner of the map. If you look at that specific buzz, you can see it was brought into Google Buzz from FourSquare. Forum discussion at Google Blogoscoped Forums and Google Mobile Help.